This week's giveaway is from Trish of fromtrish. 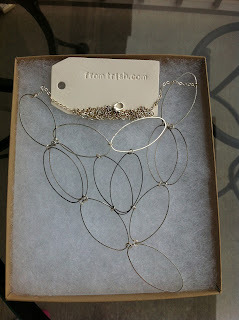 She is giving away this original design necklace. 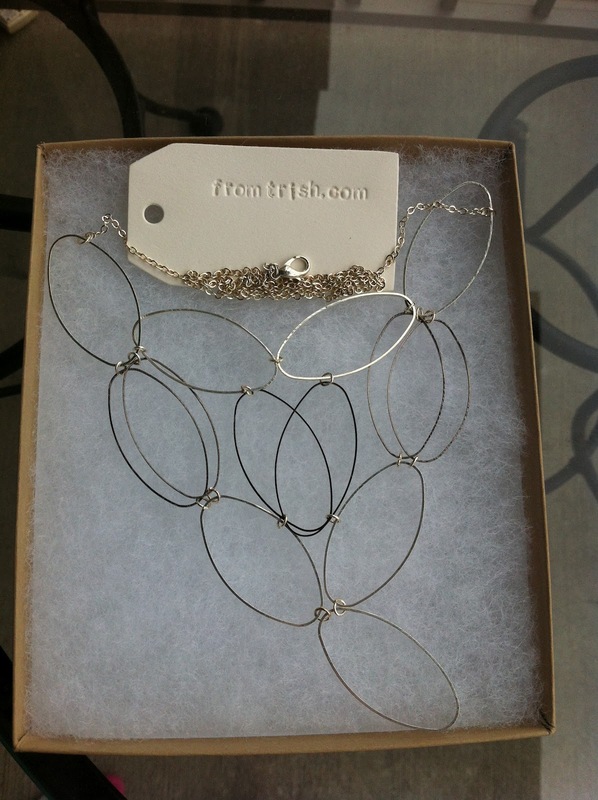 This light, metal necklace is one of Trish's original designs. In two tones of metal, with bold yet simply elegant loops, it could become your new favorite "basic." The metal is nickel-free silver and gunmetal. The bib-style is about 6" wide with a 5" drop. It can be worn both high and low - the fastener adjusts over a 4" range. And it's wonderfully versatile - it can be worn with both a turtleneck and a V-neck shirt. This would be a wonderful piece to add to your wardrobe or to give as a gift! Enter to win today! Contest ends Saturday, October 13th, at 12:00 noon Central. One winner will be chosen by Random.org. 7. Become a Facebook Fan of fromtrish. Comment back here with your Facebook name. Existing fans just leave your Facebook name here. I used to find the soft brown of white oak leaves to be disappointingly dull, but now I've come to appreciate their subtle, understated beauty. Here's a nod to the many autumnal shades of brown, the harmonizing warp that unites the vivid reds and golds in the complex tapestry of fall. 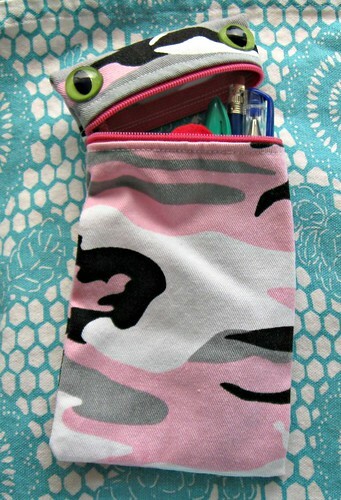 This week's giveaway is from Lori Lee Sampson of Twistmo. She is giving away 10 mini monograms. Mark your stuff! 10 Mini Monogram Decals will add a touch of class with Twistmo's personalized monogram decals. You get 2 large (5 inches) and 8 small (2.25 inches). They're cut from your choice (choose from over 30 colors) of richly colored matte finish home decor vinyl. 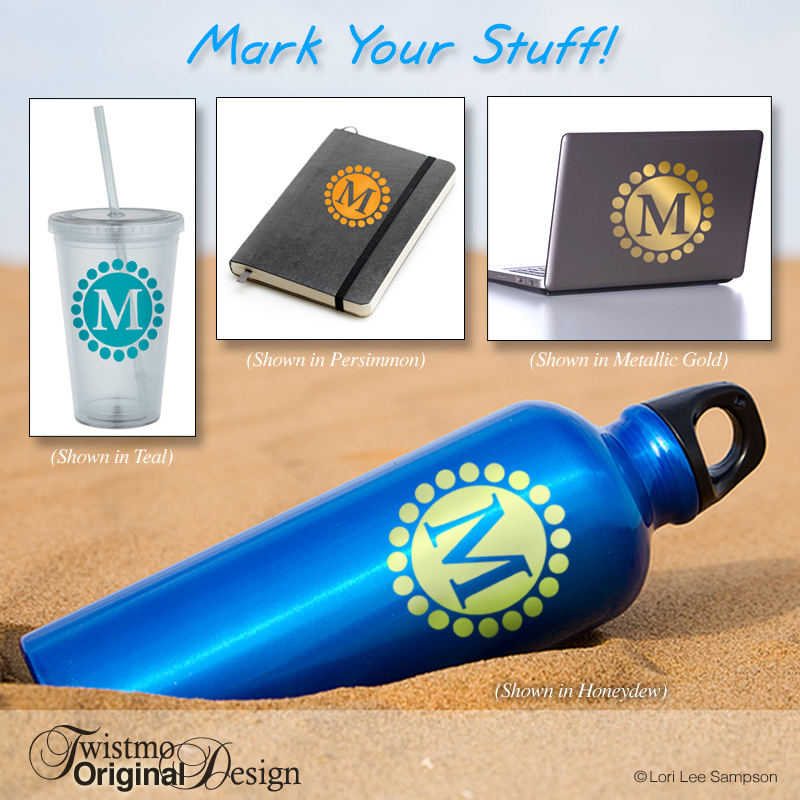 Great for Eco-friendly water bottles, acrylic tumblers, notebooks, journals, laptops or any clean smooth surface, even your car. They stick tight even when wet yet will remove easily. How to Enter: Visit Twistmo, pick your favorite item and leave a comment on this post about it. (Scroll to bottom of post and click on Comments) Make sure you include your email address so we have a way to contact the winner! 7. Follow Twistmo on Pinterest. Comment back here with your Twitter link. Existing followers just leave your Twitter link here. 8. Follow Twistmo on twitter. Comment back here with your Twitter link. Existing followers just leave your Twitter link here. 9. 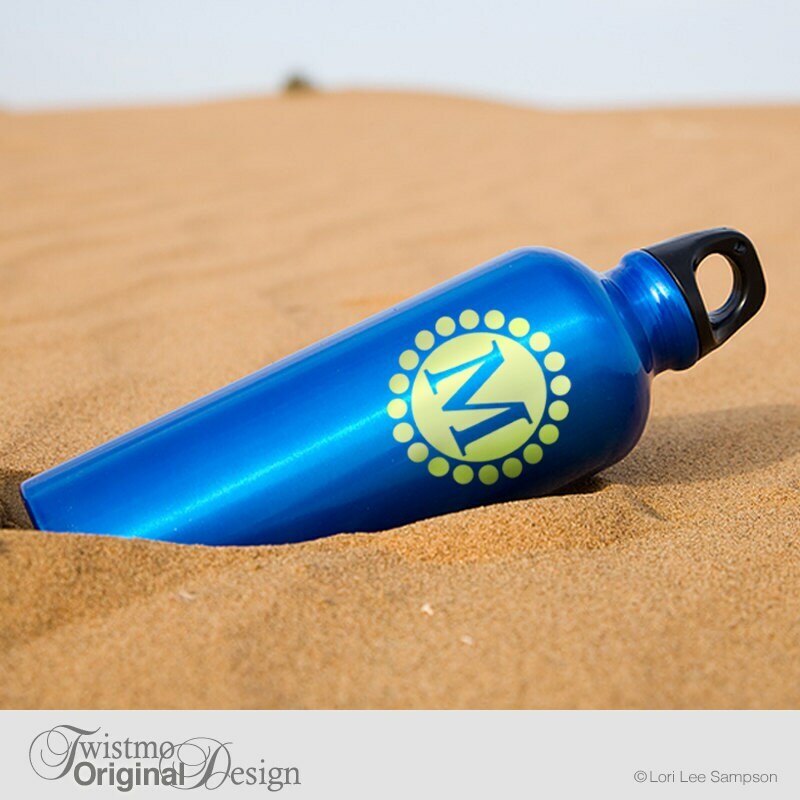 Become a Facebook Fan of Twistmo. Comment back here with your Facebook name. Existing fans just leave your Facebook name here. 10. Follow Lori's blog. Leave a comment letting us know you are a follower. If you are already a follower, leave a comment anyway, as each comment is an entry. Contest ends Saturday, October 6th, at 12:00 noon Central. One winner will be chosen by Random.org. It's come again. That time when chaos has filled my studio/office space. I work from home, as many of us do, and I am finding myself avoiding that space because it's so cluttered and unattractive that I can't seem to get those creative juices flowing. I avoid that my studio at all costs. I do laundry, search Pinterest for recipes; I even clean the downstairs bathroom just so I don't have to step into my studio! Well, it's not quite that bad, but I do need to organize and spruce it up. I was reading an article about tips for staying organized and on task while working at home. They said that you should remove the distractions. Sorry, I can't remove my laundry and I certainly can't remove the bathroom. I decided that I needed to reorganize the studio and then make it look pretty. These are some items that inspired me make my space more functional as well as pleasing to the eye. 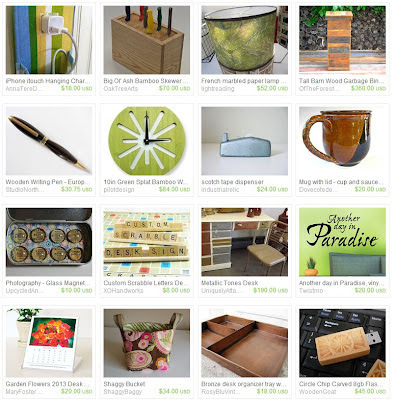 Take a look at these fabulous finds that our talented MN natives are selling on Etsy. This week's giveaway is from Amy of JuteBaby. She is giving away this sweet Polka Dot Plush Baby Tag Toy and Teether. Aw! Isn't this little critter cute? The simple, classic design is perfect for little hands. Tag toys are the ideal first toy for babies to grasp and chew. The inspiration to create JuteBaby Tag Toys came from a toy just like this one Amy had for her own son. She wanted to give him something that she knew was safe, hand made, and would keep him busy for hours! He loved the handmade toy so much that they couldn't leave the house without it! A JuteBaby makes an adorable personal and unique gift for new parents and their new little ones. This toy is safe for all ages, developmentally suited for ages 3 months and up. Amy uses super soft Chenille for the front and cotton for the back. - The face is embroidered on so it is completely baby safe! 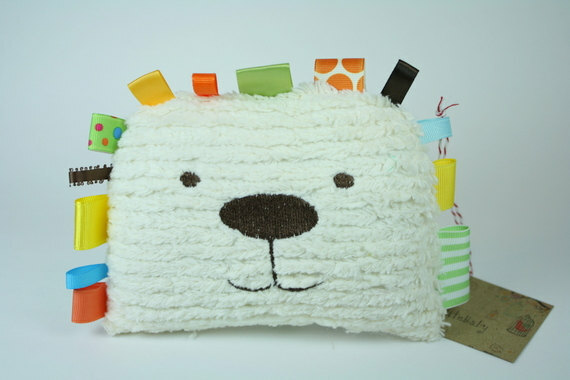 The tags are made from coordinating ribbons and toy is stuffed with a hypo-allergenic Poly-Fil stuffing. Amy machine stitches the pieces multiple times to ensure they will not disconnect. How to Enter: Visit JuteBaby, pick your favorite item and leave a comment on this post about it. (Scroll to bottom of post and click on Comments) Make sure you include your email address so we have a way to contact the winner! 7. Become a Facebook Fan of JuteBaby. Comment back here with your Facebook name. Existing fans just leave your Facebook name here. Contest ends Saturday, September 29th, at 12:00 noon Central. One winner will be chosen by Random.org. This week's giveaway is from Mara of Dragonfly Adornments. 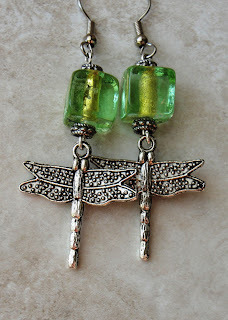 She is giving away these super cute dragonfly and glass earrings. Mara created these dragonfly earrings using pretty dragonfly pewter charms. She uses only lead-safe pewter in all her pieces. The earrings were embellished with artistic square glass beads, flanked by pewter beads. The dragonfly is said to symbolize good luck as well as positive change. How to Enter: Visit Dragonfly Adornments, pick your favorite item and leave a comment on this post about it. (Scroll to bottom of post and click on Comments) Please make sure you include your email address so we have a way to contact the winner! For Bonus Entries: Please leave each in a separate comment, as each comment is an entry (To qualify for extra entries you must do step one above). 7. Become a Facebook Fan of Dragonfly Adornments. Comment back here with your Facebook name. Existing fans just leave your Facebook name here. 8. Follow Dragonfly Adornments on twitter. Comment back here with your Twitter link. Existing followers just leave your Twitter link here. Contest ends Saturday, September 22nd, at 12:00 noon Central. One winner will be chosen by Random.org. Fun Friday Finds: Time to Fly? Have you noticed the geese flying overhead lately, loudly discussing their travel plans, practicing their vee formation? Warblers are on the move now, too, passing through the Twin Cities from their summer homes up north, snapping up backyard insects and grabbing a few bites at our bird feeders before they move on. The hummingbirds are filling up on nectar and the monarch butterflies cluster around the late summer flowers, charging their batteries, getting ready to fly to Mexico. Safe travels, little friends! We'll be here when you return. 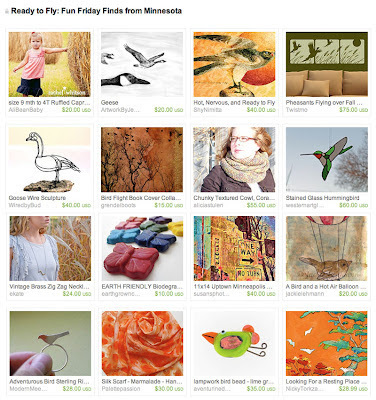 These selections from Minnesota Etsy shops evoke the spirit of the fall migration; perhaps you'll find an item or two to nurture your own wanderlust. 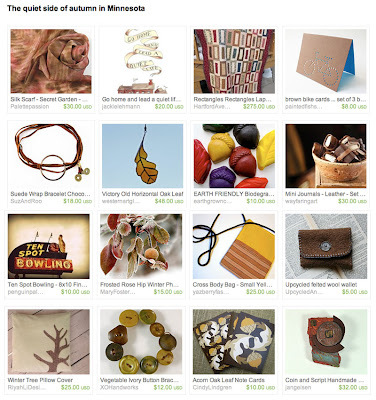 Click on the image to go to the Etsy treasury. September Challenge - Back to School! This month's challenge theme is Back to School. Voting ends at midnight on September 15th. This week's giveaway is from Myla of Sweet Bee Honey. She is giving away this yummy honey gift set. This fabulous honey gift set includes an 8 oz. glass jar of honey, a hexagon beeswax candle, and a lemon-eucalyptus honeycomb soap. A wonderful treat for all your senses! Pamper yourself or someone you love with this sweet set! Contest ends Saturday, September 15th, at 12:00 noon Central. One winner will be chosen by Random.org. 7. 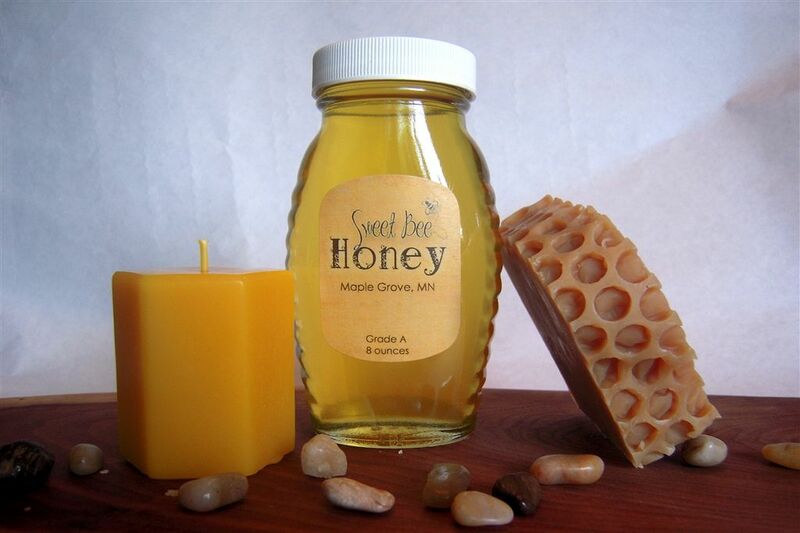 Become a Facebook Fan of Sweet Bee Honey. Comment back here with your Facebook name. Existing fans just leave your Facebook name here.